The international Monetary Fund is holding its annual meeting in Peru this week, and prior to its commencement it has both downgraded its estimates for global growth and warned of what it sees as two significant risks to the world economy. These are the possibility of a further slowdown in China, and the likely devastating effects of plunging commodity prices in emerging markets. The IMF’s downgrade of growth on a worldwide basis is all the more concerning for the fact that the latest warning represents a continuation of a falling trend – this estimate is below both its earlier growth forecasts this year, in April and July. The Fund is not slow to criticise the US Federal Reserve, for failing to communicate effectively in its last monetary policy meeting, in September, when it failed to raise rates despite comments prior to it that indicated that a first increase was possible on that occasion. 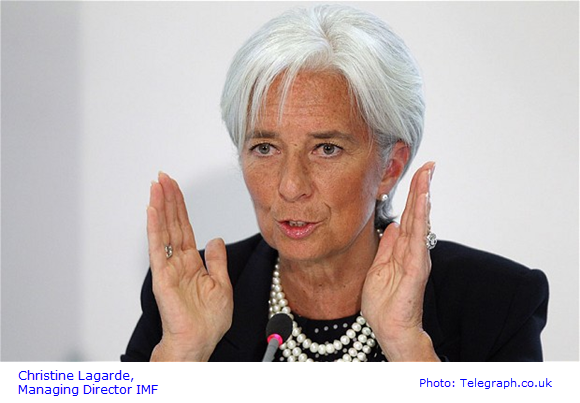 According to the IMF, greater transparency by the FED would ease possible disruptions in emerging markets. The conclusion in the IMF World Economic Outlook publication says that the “… distribution of risks to global growth remains tilted to the downside”. Last evening, the President of the ECB, Mario Draghi, was scheduled to make a speech at the European Central Bank in Frankfurt, on the occasion of the inauguration of an art installation at the central bank. This was picked up by the good people who compile the Forex economic calendar, and included in it. As a result some expectation was raised that he might provide insights into possible developments in the ECB, maybe even with regard to the burning question of Quantitative Easing (QE). In the event, while certainly very gratifying for the artistic community in the Eurozone, the speech was a flat-out anti-climax as far as economic matters were concerned. “Art unites” he said, “but to engage in art also means to accept different perspectives, and to embrace the possibility that different, sometimes even incoherent perspectives exist”.